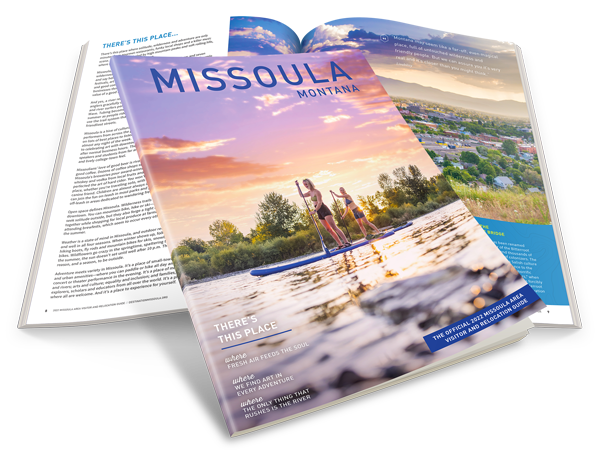 Missoula sits at the confluence of five river valleys, so it shouldn’t be a surprise that endless opportunities for water recreation abound. From easy floating to ripping Class 4 rapids, Missoula’s waters suits all different styles of recreational desires. Check out the different water recreation opportunities in this quirky mountain town. That’s right: you can surf in this mountain town! Brennan’s Wave, a manmade wave in Caras Park, provides entertainment for surfers of all ages and abilities. Stand-up paddle-boarding is a fun way to get out on the water and try a new, challenging activity! Whether you stand up on your feet on your knees, you are sure to have a great time on the river! Alberton Gorge, just outside of Missoula, offers world-class rapids for white-water rafting, canoeing or kayaking. Another great option is taking a kayak down to Brennan’s Wave in downtown Missoula. Take is easy and float the Clark Fork from a variety of put in points up the river from Missoula. From speed boats to canoes and everything in between, Missoula’s surrounding rivers and lakes are perfect for every type of boating. To some, rivers mean only one thing: fishing. Missoula’s surrounding rivers have many opportunities for fly-fhsing, made famous by Norman Maclean’s novella A River Runs Through It.